Set in the heart of downtown Brooklyn, just steps from the subway, Brooklyn Academy Music and the Brooklyn Bridge, this vibrant hotel puts the best of the borough at your doorstep. 196 spacious rooms and suites feature WiFi, flat screen HDTVs, and guests can enjoy breakfast and dinner at Black Walnut. 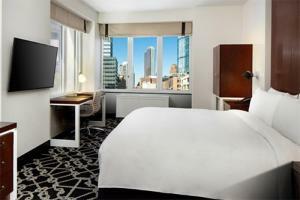 The hotel is just six blocks from Barclays Center, home to the Nets and the Islanders. The many attractions of Manhattan are just a short subway or cab ride away. Located in Brooklyn, 5 miles from New York City, and 11-miles from LaGuardia Airport. Brooklyn Academy of Music, Brooklyn Bridge, New York Stock Exchange, Brooklyn Museum, Barclays Center, and Battery Park are all within a 45-minute walk or short cab ride from the hotel.